Parrot has been known for producing top quality drones capable of capturing great images for several years now. While some models of the para drones can retail for $500-$1000 depending on the accessories you want to use with them, the Parrot AR drone 2.0 Elite Edition is one of the most affordable full-size drones available on the market currently. At a price point of under $300 for the standard version and under $370 for the version with two batteries, The Parrot AR Drone 2.0 Elite Edition sits on the line between a great toy drone and a borderline professional drone. The parrot AR drone 2.0 is mostly created using plastic as well as a Styrofoam body. The drone can take videos without sound as well as quality still photos. Although it doesn't have the same type of resilient construction that you can find in many of the world's top drones today, it also comes in at a price point that's considerably cheaper. 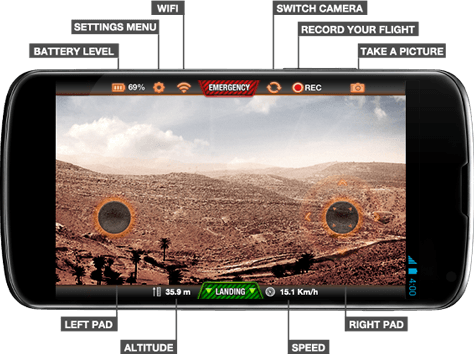 The Parrot AR drone 2.0 is powered entirely by a Wi-Fi hotspot and in application. It does not come with any kind of control joystick or remote. The drones onboard cameras however do allow you to get a birds eye view of the action as you are flying it. Overall the Parrot AR drone has become a very popular choice for drone pilots as they are starting out the process of filming from a drone. If you are interested in getting one of the best hobby drones on the market, this is a fun gadget to pick up to learn how to fly a drone. It might it be the newest or most refined product on the market, but it is fairly reliable for a tablet controlled hobby drone. Some of the main features of this drone include the refined application which is available for iOS and Android smart phones and tablets. This is an application that Parrot uses with many of their drones and they have created separate versions for every major drone they produce. The version of the application for the quad copter is easy to get started with and free to download. As well as offering piloting control is you can record and share videos as well as pictures directly from the application to social media or to other devices within your home. The drone features a camera for high-definition live video streaming, recording and still photos. The drone also features a live view that can be used with the app for flying the drone. This can help with maneuverability and with learning how to fly the drone. 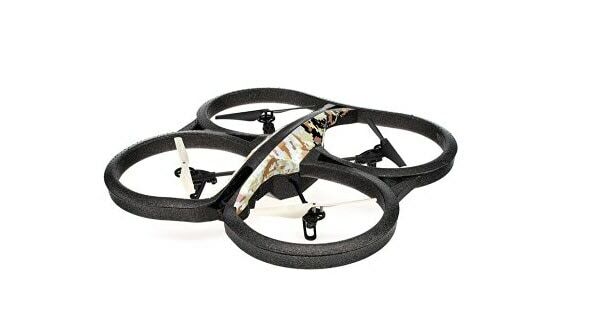 The main design for this drone is mirroring the look of camouflage. The main component used in the construction of the drone is plastic and Styrofoam. This case an extremely lightweight but the drone also doesn't come with many of the safeguards in ultrasound sensors that many of the other drones in the professional Parrot line have to offer. As a result, more of the focus is placed on the pilot in actually flying the drone. The good news is that there are a wealth of settings available in the application to help with takeoff and landing. It can take more time to master but with the lightweight construction of the drone, it is very maneuverable. The lightweight construction however can run into problems during a crash. This is not a drone that is designed to survive a hard landing or collisions. It also doesn't fly particularly well in poor weather. The battery life on this drone is considerably shorter than many of the other drones available in its size. The main problem that you can face when piloting this drone is its 5 to 10 min. flight time. If you have settings on the drone to safely land when it reaches near the end of its battery life, you can expect of flight time of just 6 min. on average. This flight time is remedied by purchasing the extended battery from Parrot for an additional $50. This can often extend flight time to at least 10 to 15 min. with a maximum flight time of 18 min.. The takeoff and landing settings can really ease the process of learning how to fly this drone. The app is extremely responsive and the lightweight nature of the drawn makes it very maneuverable while it is in flight. This drone has become a favorite toy in the community to learn how to perform flips and other air trips. With a recommended flight height of within 50 ft this drone can climb fast and perform quite well in fairly calm conditions. The control Range on this drone is relatively low as it is operated via Wi-Fi hotspot. In most cases the drone can be controlled within 35 yards but the signal can get week outside of this zone. Making sure to keep the drone relatively close will make sure that safety protocols are not turned on for an automatic landing or so that the drone does not crash. The camera quality on this drone is capable of producing a 720P picture. It doesn't come with an additional mount so your camera quality is quite restricted. The image quality from the drone is fair but definitely not something that you would want to use for ongoing filming or still capture in the air.